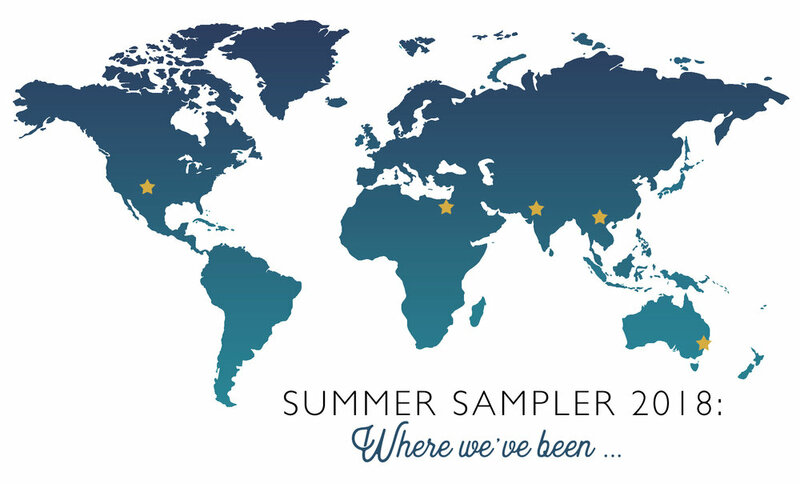 Welcome to week 5 of the Summer Sampler Series : Summer Road Trip quilt along! This week we are traveling to Sydney, Australia to make our block Points, by Kristy Lea of Quiet Play. Kristy's block is inspired by the points of the Sydney Opera House and the lines of the Harbour Bridge. So...this is probably the hardest block of the quilt along. As you can probably see, I don't sew a lot of curves! (Unless you count sewing on Girl Scout and Boy Scout patches.) My advice this week is not to try to sew this one in a single sitting, and don't be too hard on yourself if it's not perfect up close. Although I had to take an up close picture for this blog, I don't think mine looks too terrible when I stand back! As always, remember to print your templates out at 100% of "Actual Size", and decrease your stitch length when stitching on the paper. 1. 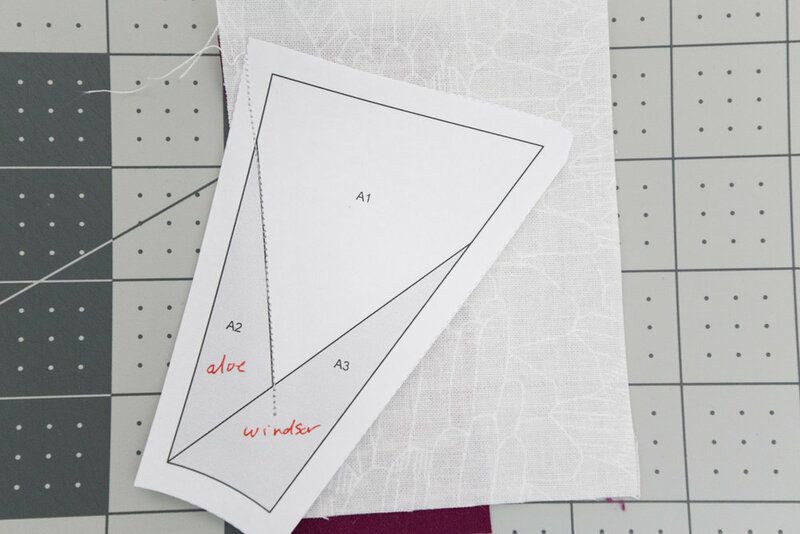 Remember, when piecing your units, make sure your fabric covers the entirety of A1 and at least 1/4" of the fabric overlaps into the A2 space. This first piece of fabric should be right side out (away from the paper). 2. 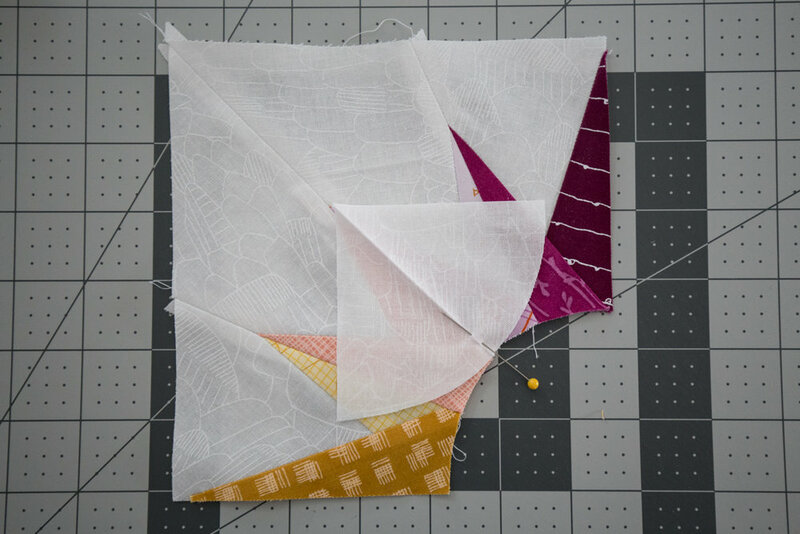 Grab your fabric cut for A2. Place that right sides together with your fabric that is in place for A1. 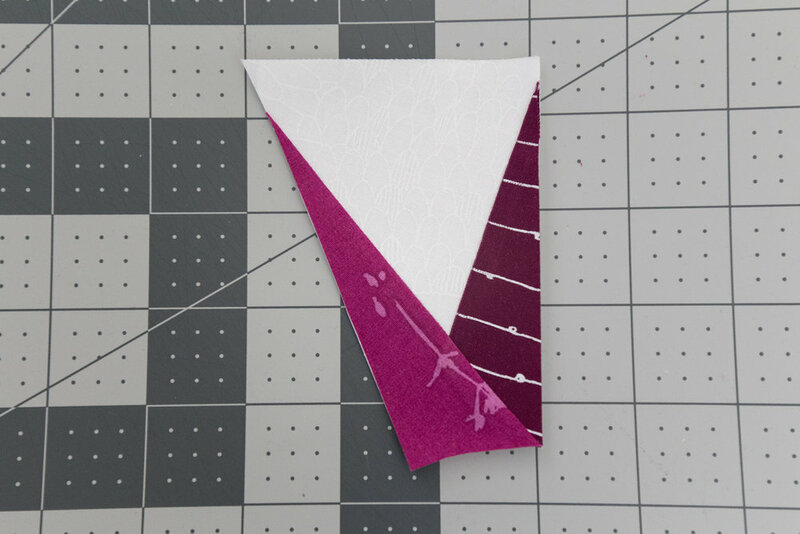 Make sure 1/4" of your A2 fabric is also overlapping into the A2 space. 3. 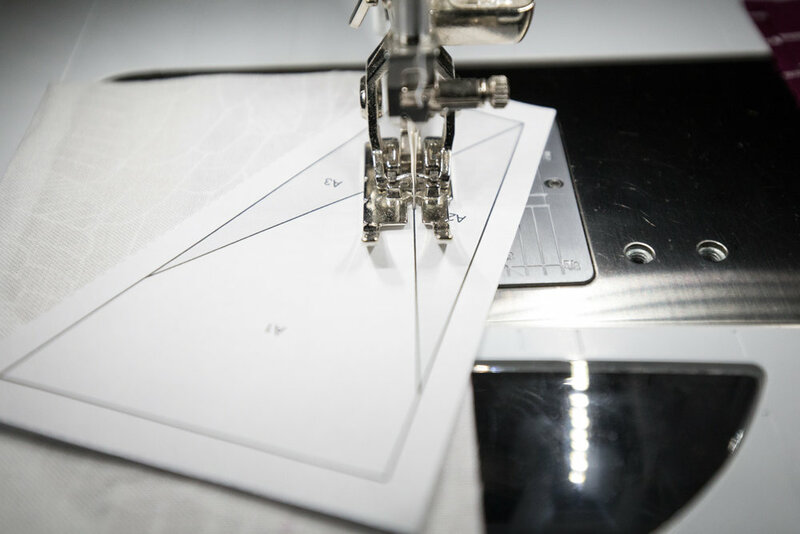 Stitch down the line between A1 and A2, and be sure to take a few stitches into the seam allowance. 4. Select your fabric for A3. 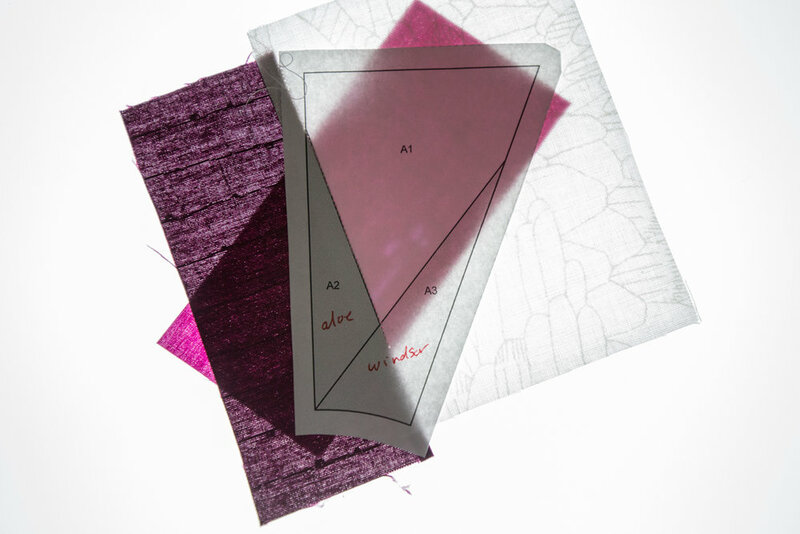 Place your fabric right sides together with the A1/A2 fabric on your unit. 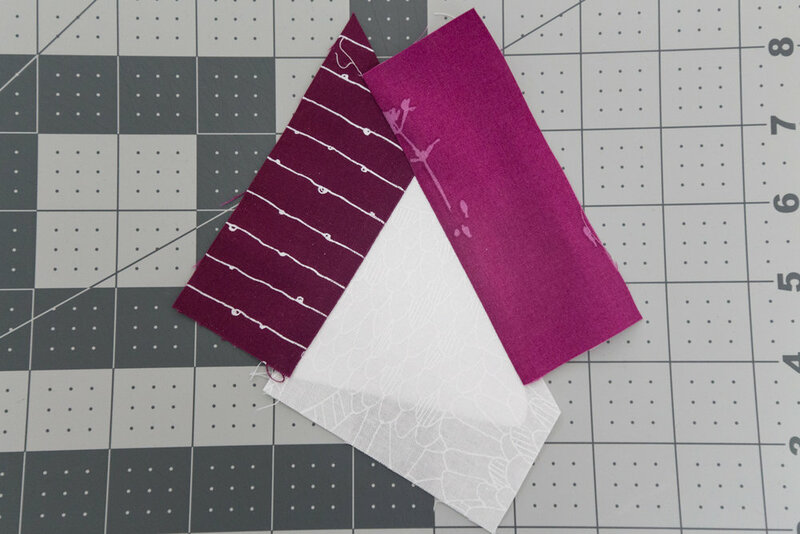 Line up your fabric so that 1/4" of it overlaps into A3. I like to hold my fabric and unit up to the light of my sewing machine to make sure it's in the right place. 5. Stitch down the seam, making sure to sew into the seam allowance. 6. 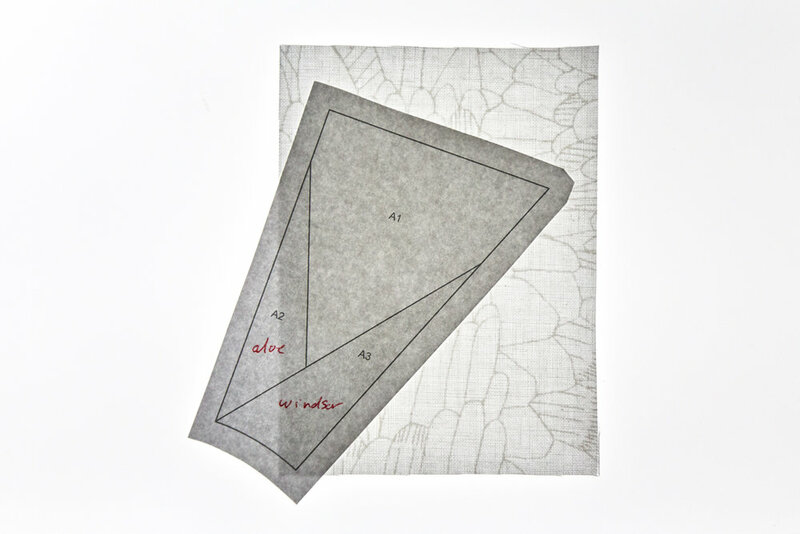 Fold back your paper at the A3 seam line. 7. Flip your unit over and trim 1/4" from your sewn line. 8. 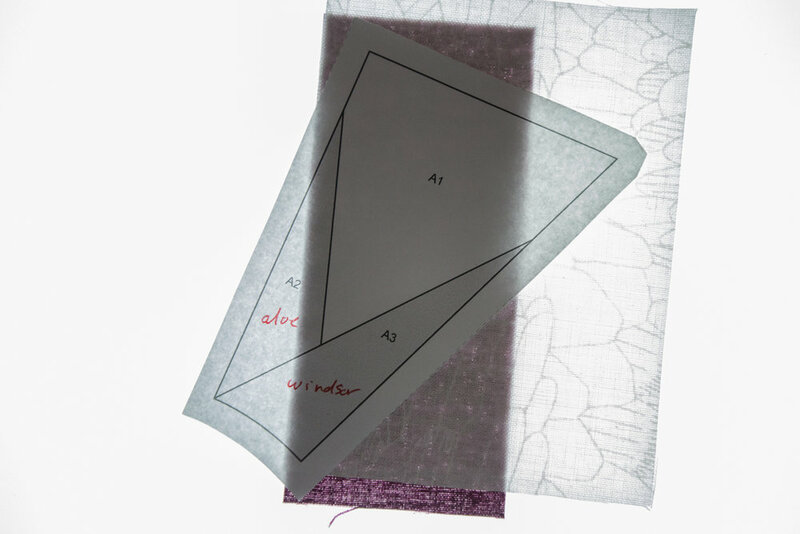 Fold your paper back in place and press your fabric flat. 9. Flip your unit over and, using your ruler and rotary cutter, trim around your template. If you happened to cut your template out too close to the edge, just make sure you are measuring 1/4" off the inner lines. 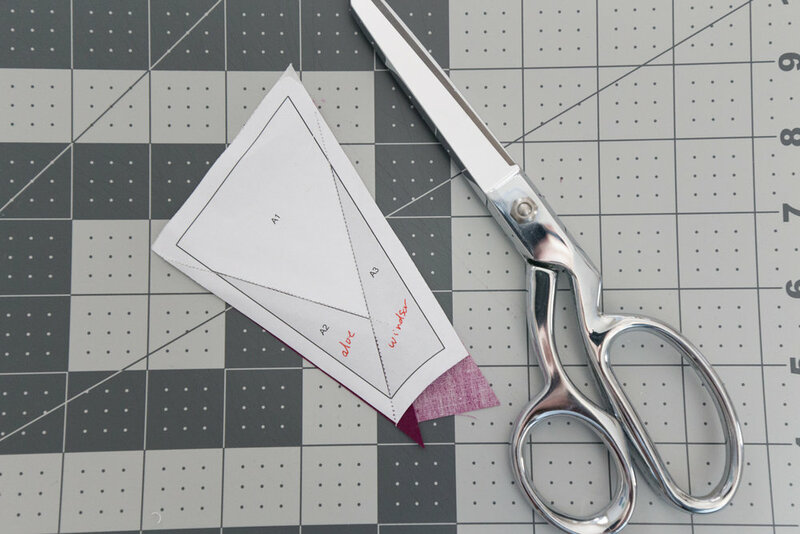 Use scissors to cut along the small curved seam allowance line of the unit. 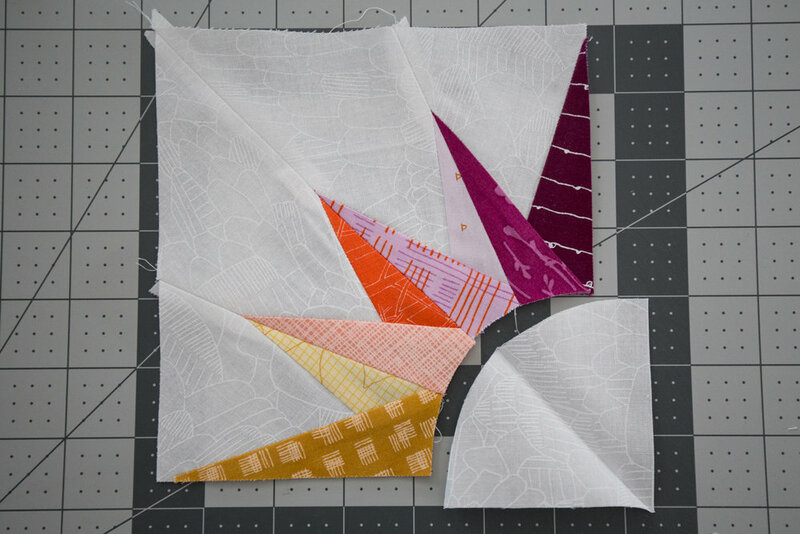 Repeat this process for all of your paper pieced units. When it comes to sewing curves, I admit I am not an experienced expert. But I thought I would post some photos of the pinning, in case some of you are new. 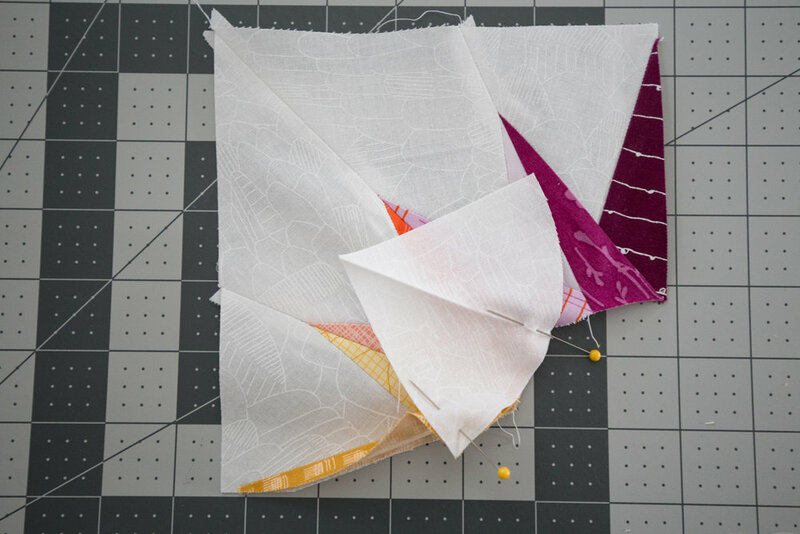 Fellow Summer Sampler Series 2018 designer Angela Pingel also has a video on sewing curves. 1. 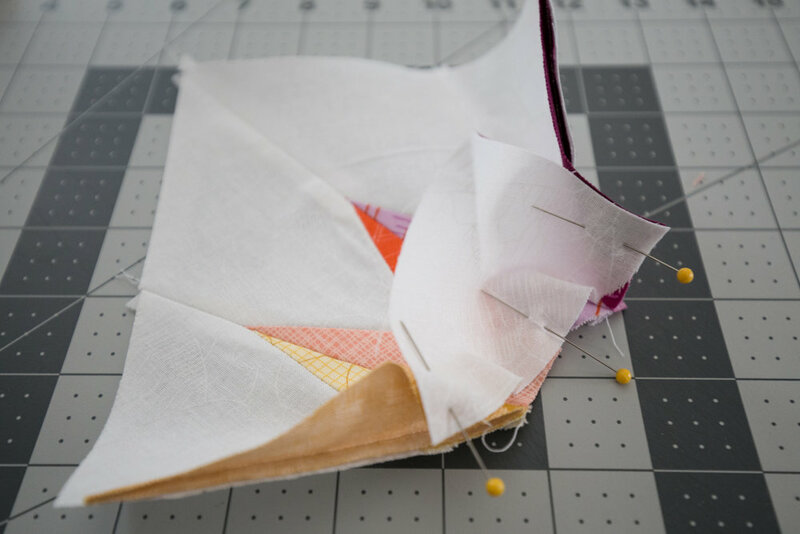 After pressing your crease in the center of the curved template piece, line that crease up with the center of your paper pieced unit. 2. Place right sides together and pin the center into place. 3. 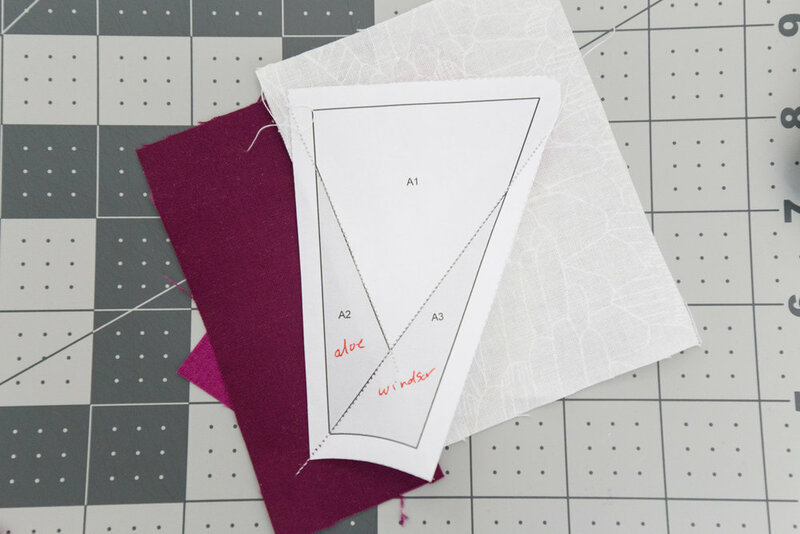 Work your fabric so that the edge of the cut curved template fabric is lined up with the edge of the paper pieced unit, as shown. Pin into place. 4. Do the same thing on the other side. 5. 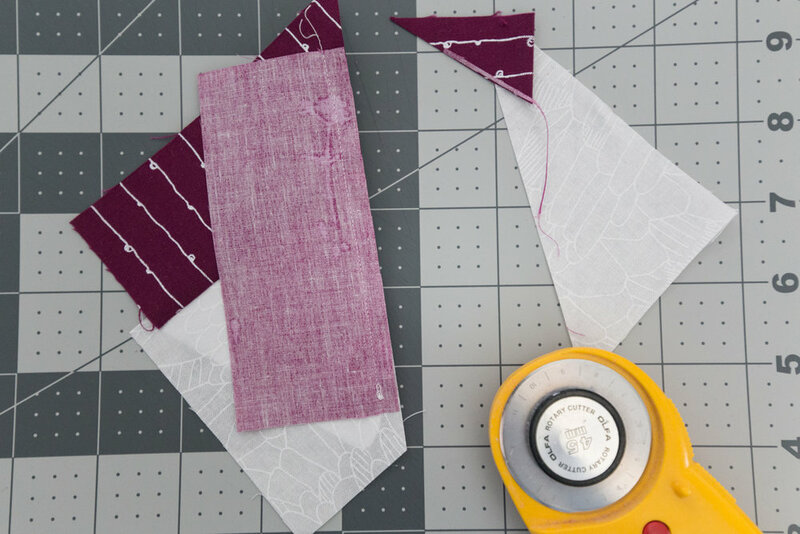 As you sew that 1/4" seam around the curve, take time to pivot and lift your presser foot as needed, keeping the fabric that you are actually sewing at that moment straight. I hope that helps some of you! And if you are a visual learner like me, don't be afraid to look up additional sewing curve videos on You Tube. I can't wait to see everyone's blocks!